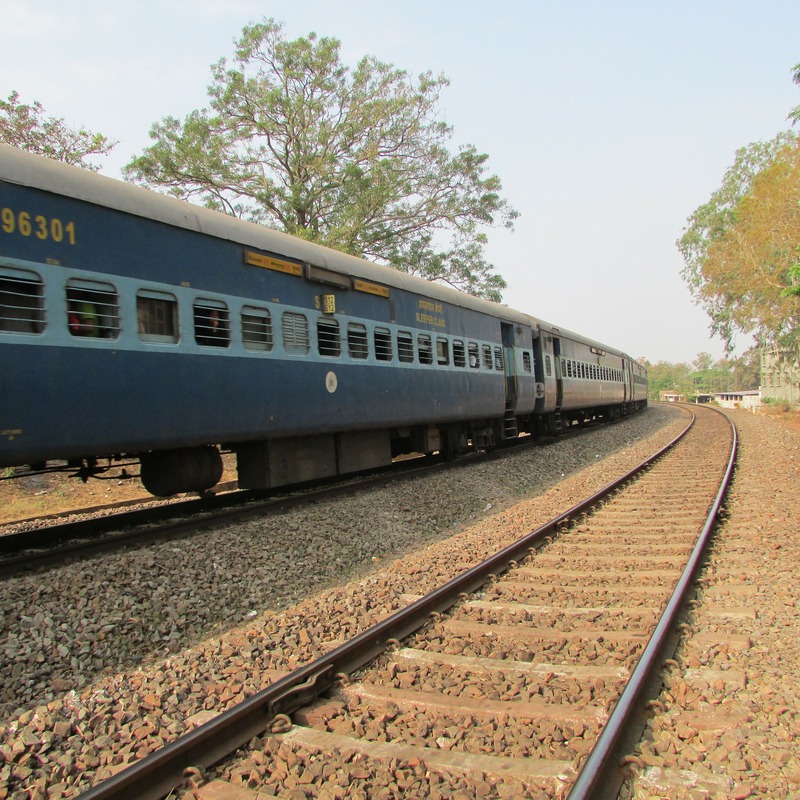 As passengers we may have experienced many digital platforms such as the e-ticketing and national train enquiry system (NTES) of the Indian Railways. However, the use of digital technologies at the Indian Railways is much broader and deeper than that. It has developed a highly functional platform by seamlessly integrating multiple applications together, evolving them with emergence of new technologies for managing the core and the passenger facing functions. It can match any world-class corporate application especially for a scale represented by the Indian Railways. We talked to senior officers in CRIS to obtain an idea of the operational and planned application landscape. Ankur: Let’s start with Control Office Application (COA). Would you please throw some light on what is the COA of the Indian Railways? CRIS: Running of trains is different from running of road vehicles. Trains take time to accelerate and need a long distance to stop. Locomotive Pilots (Train Drivers) therefore need continuous guidance from the 75+ Control Offices via trackside signals to send instructions on whether it should stop, slow down, or move at a particular signal. For this, the entire Railway route is divided into Block Sections of about 2 to 5 Km length each. 15 to 20 Block Sections make up a Line Section of 150 – 200 Km, which is controlled by a Section Controller on one Section Control Board. The signals in each Block Section are set by the Section Controller to ensure that at a time only one train can travel within one Block Section, so that there is no chance of two trains running too close to each other. Presently, the location of the trains is captured by telephonic communication with the Station Master of each station along the way. The Section Controller sitting in his Control Office watches the movement of each train in his section and plans its movement for the next 15 minutes to 2 hours to provide the most efficient train running. For this purpose, his main tools are the Control Chart and the movement forecast for the trains. 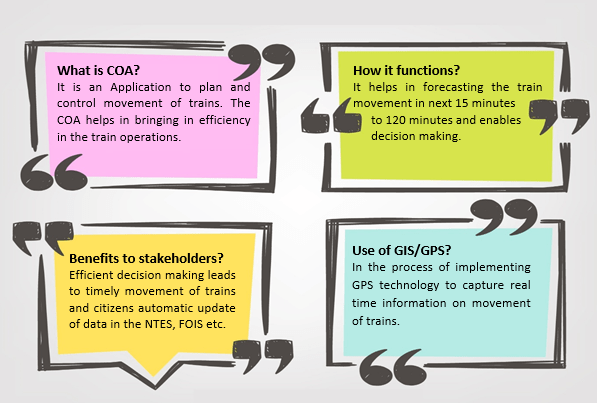 Ankur: How does the COA help in controlling train movement? CRIS: Trains of various speeds move on the rails. There are high speed and intermediate speed passenger trains which need to stick to the schedule (time-table). There are non-scheduled freight trains. There may be a situation that a fast train is following a slow train and may get delayed because of the latter. Or in order to allow a fast moving train to move fast, the slow moving trains may be kept waiting for more time than necessary. Both these situations need to be avoided. Manual charts were prepared by the section officers to visualize and forecast the movement in the next 15 minutes to 120 minutes and make the optimum decisions. Now COA does this task automatically. The data on running of the trains is captured using the telephonic system and fed into COA and the application helps in forecasting the movement of trains. It enables the control officers in making efficient decisions. Ankur: What are other initiatives at IR and how do they benefit the stakeholders? CRIS: There are multiple stakeholders, especially when the COA is integrated with many other applications and platforms at the Indian Railways. Examples include Freight Operations Information System (FOIS), National Train Enquiry System (NTES), and Integrated Coaching Management System (ICMS). The key stakeholders of the control office applications are all the people and organizations who need information on the movement of trains. It includes the section controllers, Chief Controllers, and Operations Managers who need to make decisions related to efficient train movement; passengers who need to know whether the train is running on time or is delayed and if delayed by how much time, the present position of the train etc. ; Freight customers who need to know when they can expect their consignments to arrive, and other information systems of the railways such as FOIS, ICMS etc. The COA also is integrated with the NTES. Earlier the passengers had to go to the enquiry counters to know the movement status of a train and in some cases they had to wait on the platform for hours. Now the passengers can check the status on the NTES mobile app and plan accordingly. Ankur: There is massive use of GIS / GPS technology in the governance. Are there any plans to use GIS/GPS or related technologies for capturing real-time information on the movement of trains in the Indian Railways? CRIS: That’s a good question. We, in fact, are working to use GPS for capturing the real-time movement information of the trains and locomotives. This information will be communicated to the central application using a suitable communication system. This system will replace the current dependence on telephonic systems to capture the location of a train. There will be a big process automation with this. No manual data entry will be required. This will make the forecasting even more accurate. I must also add that our approach has always been to keep scope for emerging and new technologies to be leveraged by our architecture. Be it speech recognition, IoT, RFID, or Analytics, we continue to leverage new technological developments.